Joseph Mayne was the youngest son of James and Mary Mayne. Joseph was born about 1897. He was the youngest of eleven children, nine surviving. They were a farming family who lived in Tullywiggan, Tullaghoge. 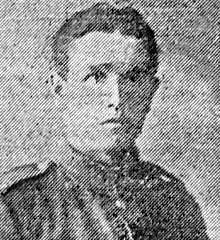 Joseph Mayne was working as a barman in Belfast at the outbreak of the First World War. Private Joseph Mayne, who was in charge of the Lewis-gun, was wounded and collapsed across his gun. He was taken to No. 55 Casualty Clearing Station at Tincourt. 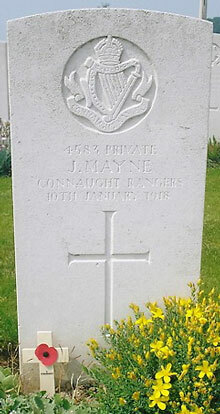 Private Joseph Mayne was serving with the 6th Battalion of the Connaught Rangers when he died of his wounds a short time later that day on Thursday 10th January 1918. Tincourt is a village about 7 kilometres east of Peronne and Tincourt New British Cemetery is on the west side of the village, just off the D199.